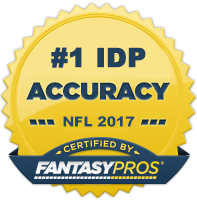 Reading this type of article thoroughly and fully understanding it's importance is going to separate you from other IDP owners and ultimately help you win your championship. Below is a list of the current three-down (every-down) linebackers in the league taken from Footballguys - IDP Forums. This list will change as training camp and pre-season games progress. I will do my best to keep it as updated as possible. So if a fantasy linebacker you are looking at isn't on this list, be aware that he is only going to be a two-down linebacker. There are exceptions to the rule of not starting two-down linebackers (e.g. Stephen Tulloch in 2009 and Dan Connor in 2010). However, as a generality I would avoid doing it. I hope this article was valuable to you in some way. Thanks for reading and please continue to visit my site!